Updated (Oct 20, 2013): The winner is Eram Rasool (Facebook: Eram Rasool; Twitter: eram81). 1) A Sally Hansen Salon Effects Polish Strips. These are the easiest to apply. Get them out of the box, measure it against your nail and apply the strip. You also get a cuticle stick, a mini-nail file and a buffer along with 16 nail polish strips. 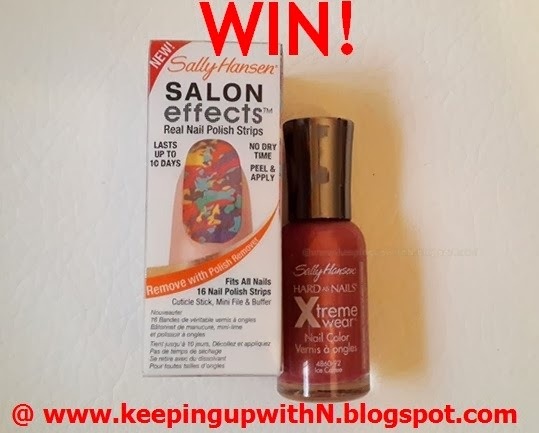 2) A fabulous Sally Hansen Xtreme Wear polish in 92 Ice Coffee. 2) Follow on Twitter here and here. 3) Post your answer to this question in the comments section below: What's your best nail polish tip? You must follow all the steps to be eligible to win. The prize must be collected from Dubai. Followed all the steps... wish to win!! Store your nail polish in the refrigerator. It will last longer and be easier to apply. I love to religiously change my nail polish on my hands based on what i wear everyday and since i change it at home just before i leave for work,the process of my nail polish drying takes a tad bit long until i found an amazing solution.Putting my hands in ice cold water.It works like a breeze! Always apply a good quality clear coat to reduce the nail polish chipping. always use a base coat, two coats of polish and a top coat. moisturize cuticles with cuticle oil. Facebook : Selma Romola R.
use a top coat every 2‐3 days to protect the polish color; and try to avoid using harsh chemicals, like certain household cleaning products, that strip the nail polish and cause chipping. Plus , removing the nail paint proper within a week of time. To keep my nails strong, I paint the inside tip of my nail with a clear polish once every five days. That seems to keep them healthy, and no one can tell I've done it!" "My secret for strong nails is to make sure that I moisturize my hands and drink lots of water." "I eat yogurt every morning and the calcium helps keep my nails strong and grow faster." "The cuticle is the natural barrier to fungus and bacteria -- and once you breach that, protection is lost," she says. This will not only make cuticles look worse -- red, swollen, and ragged -- but may also land you a nasty infection that harms the nail bed and leads to permanent nail damage. And while cutting cuticles holds the most potential for harm, pushing them back can cause problems as well. Avoid bubble sin your nail polish. Remove it every few days N apply a new one after a nice pedicure. Remove N change d nail polish every few days after a nice pedicure.